Four MK Dons goals saw Crawley lose at home for the first time since August, this afternoon. Here are five things we learned from a rare, poor Reds performance. What a difference a couple of weeks can make. Only two weeks ago, Crawley were celebrating a stunning 4-1 win over promotion hopefuls Newport County — their fifth consecutive home win — putting themselves in the mix for the play-offs in eighth place. However, today's crushing defeat leaves the Reds without a win in three games, following last week's midweek draw against Exeter at home, and Saturday's 5-1 defeat at Tranmere. The exact reason behind this sudden downturn in form, I can't put my finger on, but Reds' looked a million miles away from the team that saw off Newport with such ease and confidence just a fortnight ago. For the last two years, Reds' better performance have come against the teams challenging at the top, most recently against Newport County, whilst they came just minutes away from beating Exeter City. However, Crawley never looked like troubling second placed MK Dons and proved that improvements are needed. Chuks Aneke's game settling goal for MK was the ninth Crawley have conceded in just two games, following the 5-1 defeat last time out at Tranmere. This was more than the Reds conceded in their previous five games (eight), leaving them in 11th and with the joint highest number of goals conceded in the top 12 (29). Due to suspension and a hamstring problems, Bondz N'Gala hasn't played since being sent off during the defeat at Colchester on October 13 and his absence was telling. Crawley still possessed a leader in Mark Connolly but he struggled to live up to his normal high standards and could have benefited from N'Gala alongside him. Under Harry Kewell last season, Crawley were often found guilty of overplaying and regularly made defensive errors which cost them points. With Cioffi removing the 'playing out from the back' mentality after taking over, it seemed that the defensive mistakes had been cut from the Reds' game, but Saturday showed signs that they may not completely be a thing of the past. The tone was set for the game after just seven minutes when Lewis Young cheaply lost possession to Dean Lewington who set up Rhys Healey for an easy finish. This, and Connolly's mistake leading to the third goal, were the worst of a catalogue of errors which cost Crawley dearly. To quote Filipe Morais in his match reaction, the players will have to go back to the drawing board and cut out the little errors if they are going to restore the previous signs of improvement from last year. Reds fans shouldn't be too downhearted coming out of today's defeat, as if this season has proved anything so far, the players have the quality needed to beat anyone in the league. In the scheme of things, it was the first defeat at home under Cioffi, their first blank in front of goal since Boxing Day, whilst there were positives in the way they tried to get themselves back into the game. This was proved by a half time substitution by Cioffi, with the Italian bringing on forward Panutche Camara for defender Lewis Young to bring new attacking threat. 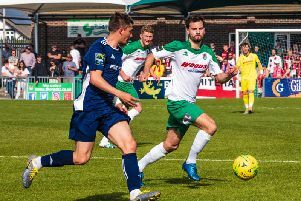 The performances of Luke Gambin and Ashley Nathaniel-George were two particular positives as they never gave up and were always trying to make things happen going forward. It just wasn't their day in the end, as it wasn't for the whole team. In what was another positive, Broadfield Stadium saw the highest number of home fans (2,667) since the start of the season. This would have particularly pleased Cioffi, who has repeatedly stressed the importance of home support and wanted to see a full crowd at the weekend. However, he will hope the result won't put anyone off attending the next home game, as they have shown this season they have the quality to beat the best in the league.